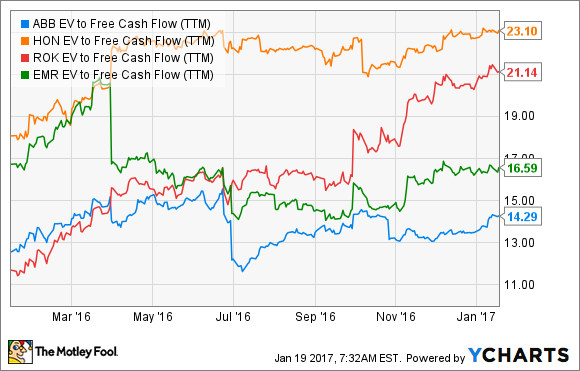 This Hedge Fund Bought $3 Billion of ABB Ltd Stock: Should You Buy, Too? Leading European hedge fund Cevian Capital is seeking to release the value in a lumbering conglomerate. Does that pressure make the stock worth buying? Was it a buy anyway? According to SEC filings, Swedish activist hedge fund Cevian Capital held more than 132 million shares of ABB Ltd. (NYSE:ABB) in September, worth around $3 billion at today's pricing. That's 6.2% of the of the utility, industrial and transportation-focused company's shares, and it signals Cevian's determination to unlock value from ABB's portfolio of companies. While it's never a good idea to blindly follow hedge fund managers, Cevian's ABB position is a statement of intent from a well-respected investment manager, so let's take a look at the case for an individual investor to buy the stock. ABB currently organizes its business into four divisions and it's Cevian's contention that one of them -- power grids -- should be spun off into a separate company. This would leave ABB's management free to focus on developing the other three divisions, which have higher growth potential. 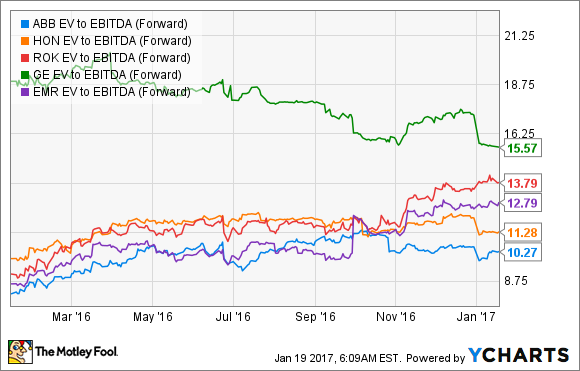 If ABB takes this path it would be following a trail well-laid recently by industrials like Danaher (NYSE:DHR), Johnson Controls International (NYSE:JCI) and Emerson Electric. (NYSE:EMR) As you can see below, all three sets of shareholders were rewarded by the respective companies' plans to spin-off or sell businesses. In Danaher's case, the remaining company comprises its higher-growth medical and technology segments, while the spun-off business, Fortive, is made up of a collection of highly cash-generative but cyclical industrial businesses. Meanwhile, Johnson Controls' spin-off of Adient -- its former automotive experience unit (automotive seating and interiors) -- left the company with its power solutions segment (automotive batteries) and building products (heating, ventilation, and air-conditioning, plus Tyco's fire and security products). In other words, investors and management have been granted two very different investment propositions in both cases. Danaher offers secular growth and healthcare exposure, while Fortive offers industrial exposure and high-cash flow generation. Johnson Controls offers exposure to commercial building and the growth potential in automotive batteries, while Adient offers exposure to automotive production, particularly in China. The idea is that separation will enhance value in a way that the combination couldn't. It's also an idea that equally applies to apotential separation of ABB's power grids unit from its other three segments. Let's examine ABB's four segments. Power grids is the largest, but its a relatively low-growth business offering power and automation products across power generation and distribution. Electrification products consist of a range of electrical products from substation to the point of consumption. Meanwhile, the industrial automation (which improves productivity of process industries) and robotics and motion divisions (motors, generators and robotics for a wide range of industrial customers) are seen as highly cyclical but with long-term growth potential. 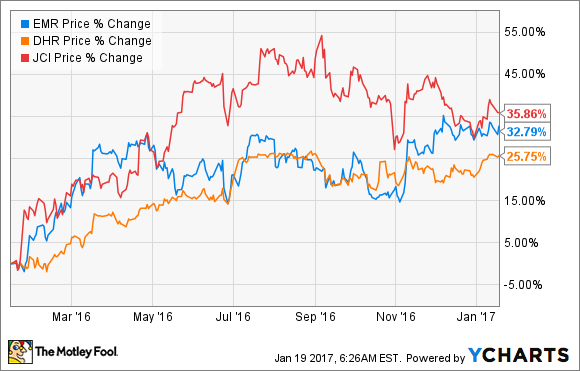 For reference, ABB competes in these areas with Honeywell International (NYSE:HON), Rockwell Automation and Emerson Electric. As you can see below, ABB's valuation -- based on forward enterprise value (market cap plus net debt) to EBITDA is significantly below that of its peers. Clearly, ABB needs to do something and its management responded to Cevian's statements by opening a strategic review of the power grids business. Unfortunately for Cevian, the conclusion of the review was that the company should keep power grids, and make plans for acquisitions and investments in internal development in order to digitalize products in power grids while increasing higher-margin services sales. As a consequence of these actions, ABB's management upgraded its target 2015-2020 EBITA margin range for power grids to 10% to 14% from 8% to 12%, coming into effect in January 2018. In fact, ABB has decided to follow another well-worn trail, one mapped out by General Electric (NYSE:GE), whose embrace of the industrial internet and drive to increase services revenue is a key part of its growth strategy. In addition, just as GE made its Predix (platform as a service) available on Microsoft's Azure cloud offering, so ABB has announced a strategic partnership to develop digital solutions on Azure. In a sense, Cevian's activism has already made ABB a more investable company. The transformation of its power grids business may not be the solution Cevian (or other shareholders) wanted, but it's in line with what GE and others are doing. Moreover, the company always has the option of changing its mind on the strategic future of power grids and taking a path more akin to the ones followed by Danaher and Johnson Controls. Meanwhile, ABB's valuation discount makes it the value play in the sector. Cevian is, directly or indirectly, helping to make it that way. Analysts and ABB management are forecasting double-digit EPS growth and margin expansion for the next few years, so this stock deserves a close look by value investors.